The recently-announced new European T20 competition featuring Irish, Scottish and Dutch city franchise teams will be called the Euro T20 Slam. Each territory will provide two teams for a group stage followed by semi-finals and a final, with the event running from 30 August to 22 September. 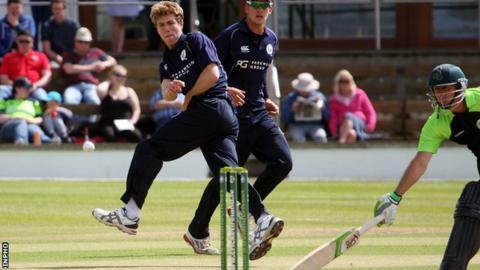 "We hope it will gain the necessary traction with fans," said Cricket Ireland chief executive Warren Deutrom. An initial 10-year agreement for the tournament has been agreed. The name was unveiled after an agreement between event managers, Woods Entertainment and GS Holding, and the three participating cricket boards, Cricket Ireland, Cricket Scotland and the Dutch governing body, the KNCB. "After consultation with the cricket boards of Ireland, Scotland and Netherlands, we come to a general consensus over the name," said Woods Entertainment managing partner Prashant Mishra. "Since the term league is used all across the world for T20 events, we wanted to add the energy factor to our tournament, hence we have decided to name it Euro T20 Slam." Cricket Ireland chief Deutrom added: "The process wasn't just about establishing a mere name but rather giving the tournament an identity which both aligned it with other global domestic leagues, yet made it a distinctive and a vibrant brand. "It was important to us to convey our points of difference that would resonate in local markets - in Ireland, Scotland and the Netherlands - where cricket is not the dominant sport." The teams will have a minimum of nine domestic players and a maximum of seven overseas players in their squads. On matchdays, at least six of the 11 will be domestic players. The Scottish teams will be based in Glasgow and Edinburgh. Further details about the venues and match dates will be announced in the coming weeks.